If you saw my unboxing video you know how reluctant I was to give the Truvia from Influenster's love Voxbox a try. But I'm nothing if not willing to take-one-for-the-team and figured I would at worst vomit and feel sick all day as I did with the EBOOST product containing Stevia that I tried last month. But how best to sample it? I'm actually not one to add sweeteners to anything. 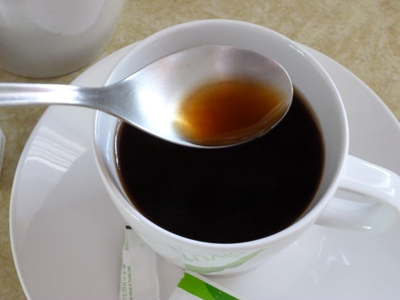 I like my coffee black and I don't always sprinkle sugar on my grapefruit. In the end I took into consideration how most others would like to use the product and went with the coffee route. While I don't usually take sugar in my coffee sometimes I'll add a bit and some milk if I'm having it in the afternoon and craving sweets, so it wasn't a completely biased test. I know Stevia is much sweeter than sugar so I was scared to add the whole pouch but went ahead and put the whole thing in there. While it was the perfect amount of sweet I could taste that yicky chemically (and to me bitter) tang that I associate with all Stevia based sweeteners. It wasn't nauseating like the aforementioned energy powder but I was desperate for a palate cleanser. I only managed two sips before I had to dump it. There is good news though. Truvia dissolved really well! Faster than sugar does. Which, in that regard at least, makes it a nice alternative to sugar. With zero-calories this might be a great alternative for those suffering from diabetes who miss sweet and worry about artificial sweeteners' many bad points. 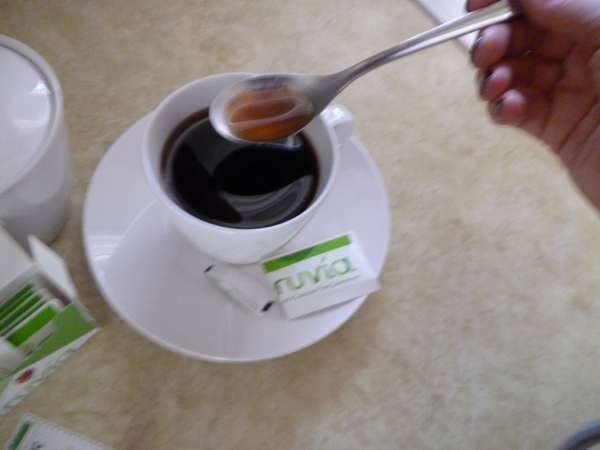 Do note that Truvia (as a Stevia based sweetener) is considered a natural sweetener, not an artificial sweetener. My mother is a bit of a health trend nut and has been using Stevia from the health food store for years and swears by it's safety and health benefits. I do feel though, that you should always research these kind of things and decide for yourself (and with the help of your doctor) if it's right for you. 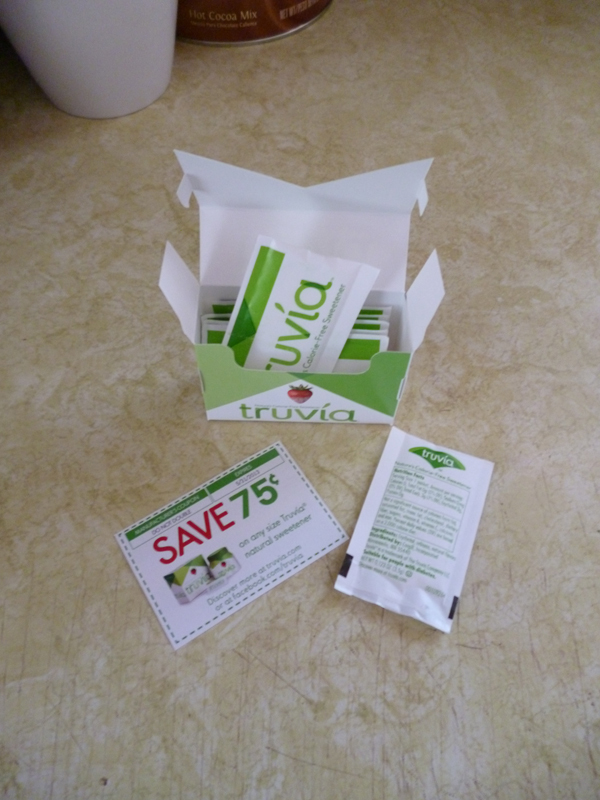 You can learn more specifically about Truvia on their website. At the time of my pregnancy with the tot (3 years ago) I tried Truvia once and didn't care for it only to later be told by my OB it wasn't considered safe during pregnancy. I believe there has been more research since then and have found information online saying the opposite: Is Stevia safe during pregnancy? I'll let you read up and decide on whether you feel it's right for you. 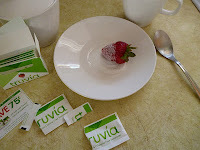 As a final taste test for Truvia I took a cue from their packaging, pulled out some strawberries, and asked the tween to come and try it with me. I definitely liked it better with the strawberries. It was very sweet and with the acid from the berries not as noticably chemical-ish in flavor or aftertaste. To my surprise my son thought it was as good as sugar. Overall, I just can't see us switching to Truvia. 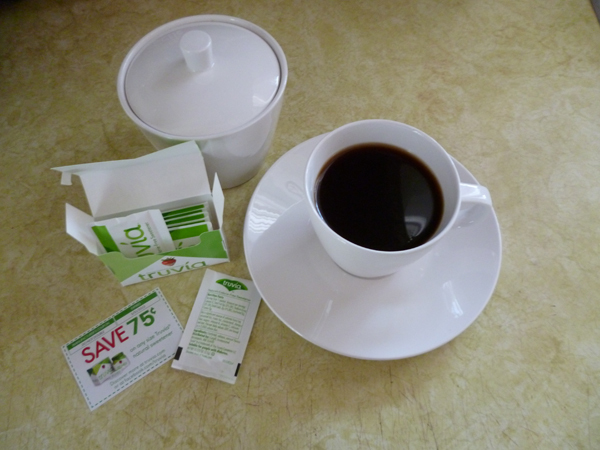 We're not a family that needs an alternative sweetener for health or weight reasons. I don't like the after-taste at all. Were our needs different, however, I would certainly consider using it in place of the nasty artificial sweeteners out there which are known to cause harm.